The story is that a long time ago on a small and enchanted little island, Guava met Cream Cheese. Guava noticed Cream Cheese first and was very taken with how smooth and understated he was, although Guava had heard that Cream Cheese could be a little sour on occasion. Suddenly Cream Cheese looked up and their eyes met. Cream Cheese couldn’t help but notice Guava because of her bright red dress. He walked across the room toward her with a smooth and seamless strut. Cream Cheese took Guava’s hand and introduced himself. She gave him a sweet smile. From then on Guava and Cream Cheese were inseparable. They were the perfect pair of sweet with a touch of sour, and they lived happily ever after. Ok that was cheesy, but you have to admit it was entertaining. Right? :/ The thing is, there is some truth in that ridiculous story. Guava and cream cheese are truly meant for each other. They are a perfect harmonious pair that will always have a special place in my heart. When I saw the recipe I knew I had to make it, asap. The original recipe was with a chocolate graham cracker crust and a cranberry swirl, but I decided to change it just a tads by using guava and a regular graham cracker crust. The bonus is that it’s a lighter version of your usual cheesecake but still managing to be rich and delicious. You need a 9 inch spring form pan. Cover the bottom and sides of the pan with 2-3 layers of foil and spray the inside with non-stick cooking spray, set aside. 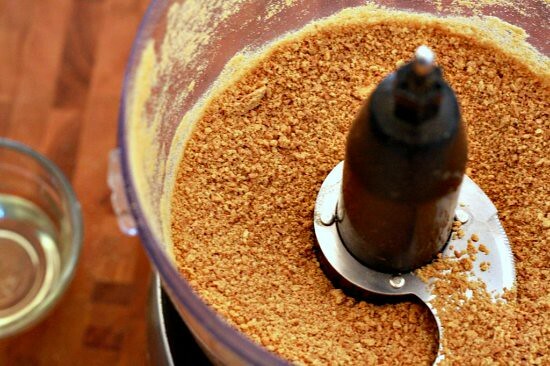 Put 4 oz of graham cracker in the food processor. It should be just one package. 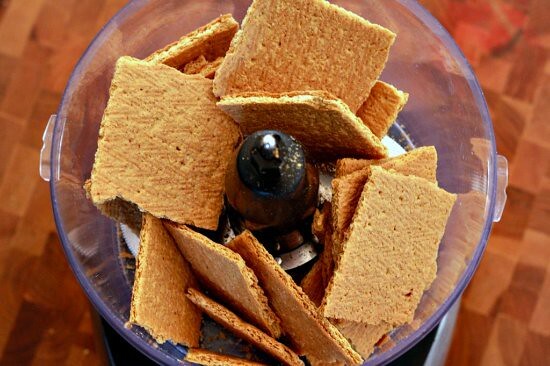 Process the graham crackers using and on/off pulse until finely ground. Drizzle with oil while pulsing. Pulse until well combined and the graham crackers start to creep up the sides. 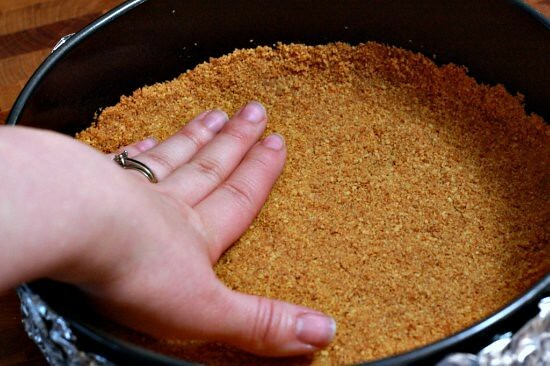 Pour the graham cracker crumble into the prepared pan. Press mixture into bottom and 1/2 inch up sides of prepared pan. Bake at 375° for 8 minutes; cool on a rack. Meanwhile back at the mixer…. 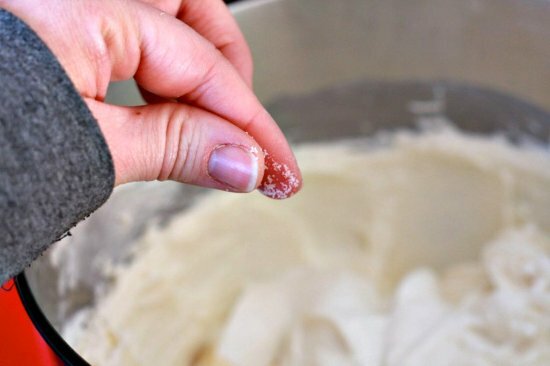 Combine cheeses and sugar in mixer bowl. Stick your finger in it and lick it….it’s yummy. Add a pinch of salt, while wearing long sleeve hoodie, because it’s stinking freezing. Add 1 cup of thick creamy greek yogurt, aaaaaand…beat it! If you don’t have Greek yogurt you can strain 1 cup of regular plain yogurt in a mesh strainer lined with a paper towel for about 1 hour. Ta-da! Greek yogurt. Add whole eggs, 1 at a time, beating well after each addition. 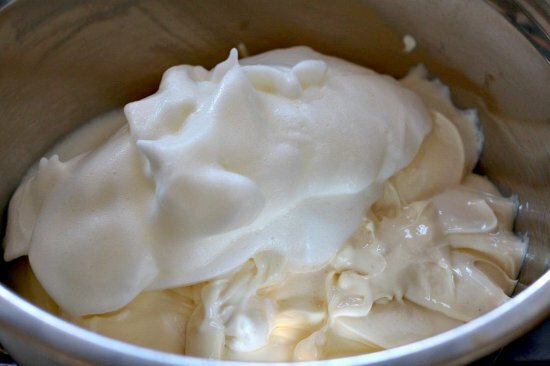 Place 2 egg whites in a clean and dry medium bowl, beat at high speed until soft peaks form using clean & dry beaters. Tip: If you have a carton of liquid egg whites use 6 tablespoons and save two egg yolks. 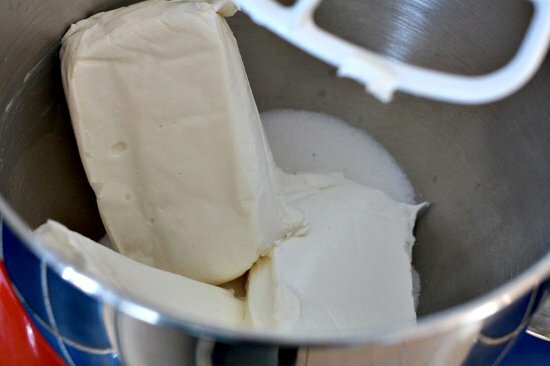 Add beaten egg whites to cream cheese mixture. 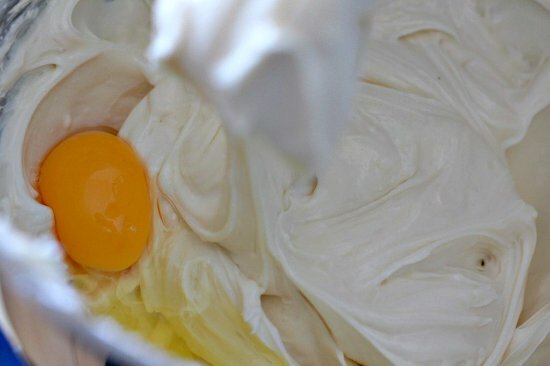 Using a spatula gently fold beaten egg whites into cream cheese mixture. Drain guava shells of syrup. 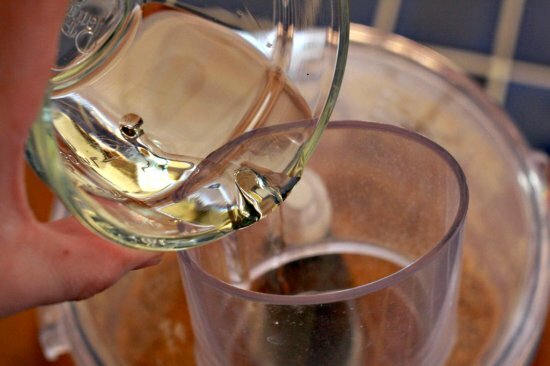 Place shells in a food processor; process 1 minute or until smooth. Dollop guava puree over filling. Swirl together using the tip of a knife. Here is where you can get creative. 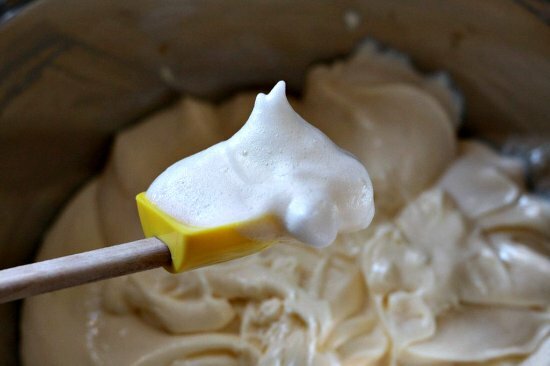 You can swirl as little or as much as you want. I am a big swirly-whirler. Place springform pan in a 13 x 9-inch metal baking pan. Add hot water to pan to a depth of 2 inches. 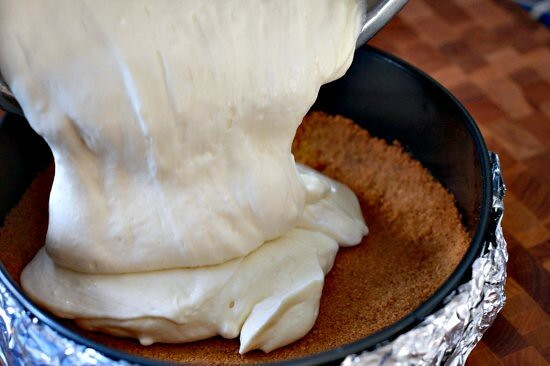 Bake at 325° for 50 minutes or until center of cheesecake barely moves when pan is touched. Turn oven off. 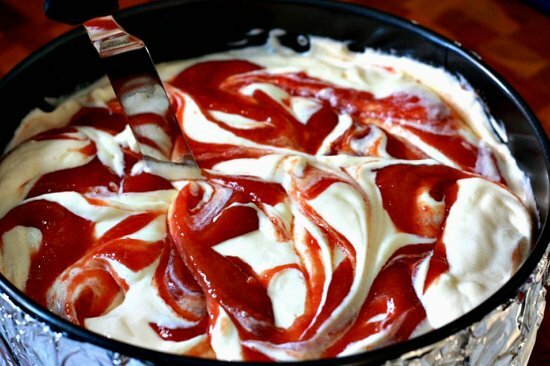 Cool cheesecake in closed oven 30 minutes. Remove cheesecake from oven. Run a knife around outside edge. Cool on a wire rack. Cover and chill 8 hours. 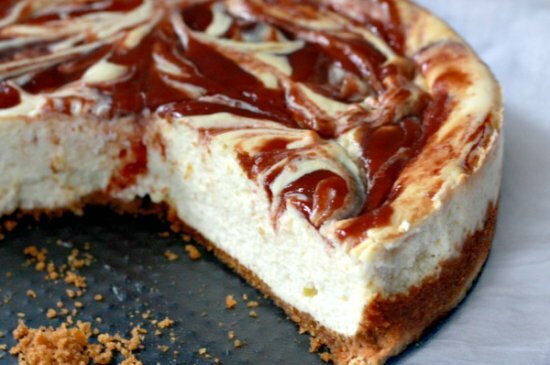 Even though this cheesecake uses low fat cheese, non-fat greek yogurt and egg whites it is everything rich and creamy that you would want in a cheesecake. If you are a fan of the dense thick new york cheesecake then you may want to look elsewhere, because this is not it. I prefer my cheesecake to be light, smooth and velvety. I like it when I can just slide the side of my fork down into the cheesecake instead of having to stab it and break a piece off. This cheesecake meets every expectation and desire I would want from a cheesecake. Then to top it of with a sweet swirl of guava….well I may as well be in heaven. If you don’t have guava shells no worries, you could easily replace the guava with blueberry, strawberry or raspberry swirl. Mmmmm…. 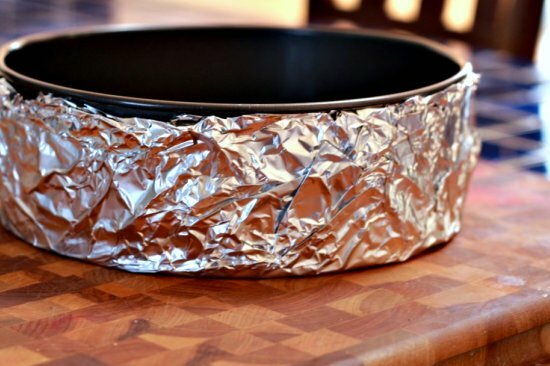 Wrap outside and bottom of a 9-inch springform pan tightly with a double layer of heavy-duty foil. 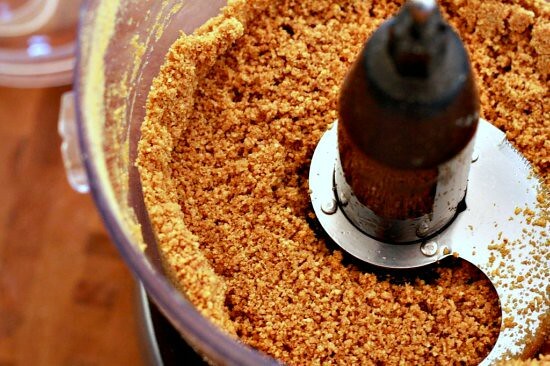 Place crackers in a food processor; process until finely ground. Drizzle with oil; pulse until combined. Press mixture into bottom and 1/2 inch up sides of prepared pan coated with cooking spray. Bake at 375° for 8 minutes; cool on a rack. 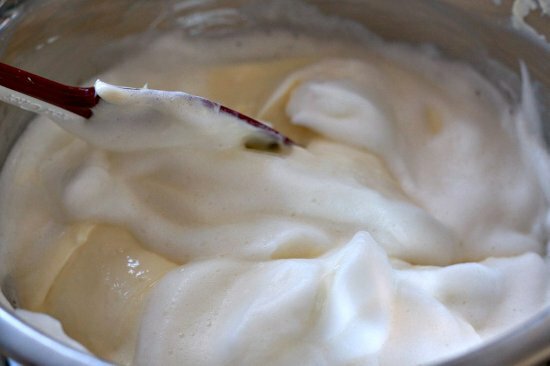 Place 2 egg whites in a medium bowl; beat with a mixer at high speed until soft peaks form using clean, dry beaters. 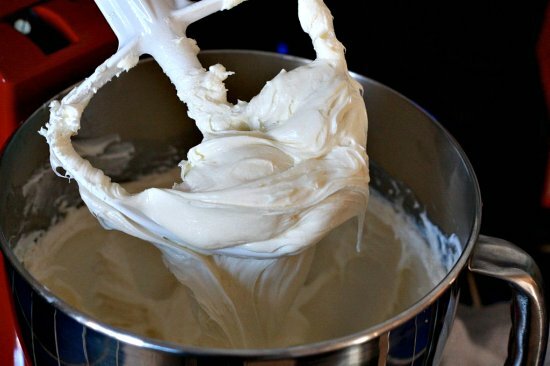 Fold beaten egg whites into cream cheese mixture. 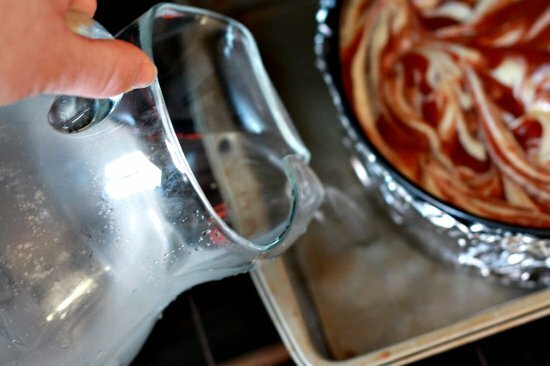 Pour filling over crust. Spoon guava puree over filling; swirl together using the tip of a knife. Place springform pan in a 13 x 9-inch metal baking pan. Add hot water to pan to a depth of 2 inches. Bake at 325° for 50 minutes or until center of cheesecake barely moves when pan is touched. Turn oven off. 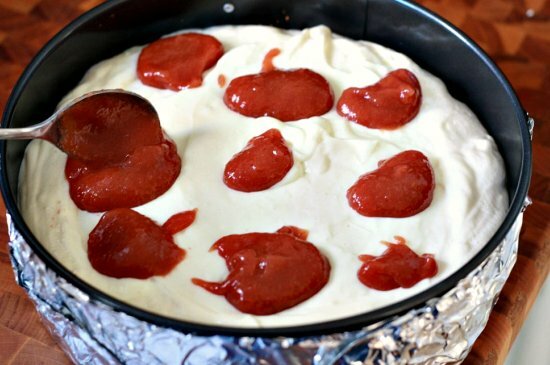 Cool cheesecake in closed oven 30 minutes. Remove cheesecake from oven. Run a knife around outside edge. Cool on a wire rack. Cover and chill 8 hours. Instead of fat free can I use regular cream cheese and yogurt? OK Thankyou so much .I will try now. plz tell me the alternate of sour cream or yogurt.can i replace it with heavy cream bcoz sour cream is also not available and yogurt is too much sour.plz help me.waitting forreply. I have not tried this recipe with heavy cream and I think it would make the cheesecake to soft. You may want to try whipping the cream first. 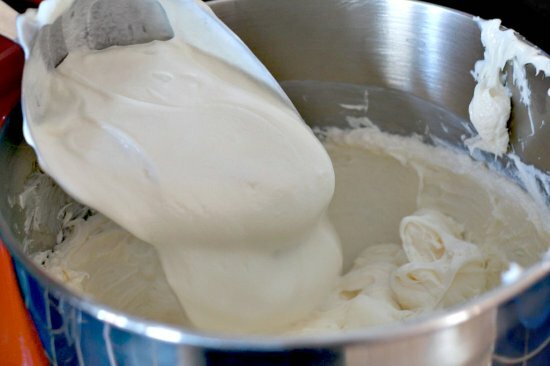 I have always made this recipe using yogurt and it has never had a sour taste because of the cream cheese and sugar. fresh cream means full fat cream not whipped nor sour .these are not available in Bangladesh thats why i m asking what should i use in placce of greek yogurt.only curd is available this is too much sour.thanx for reply. What do you mean by fresh cream? 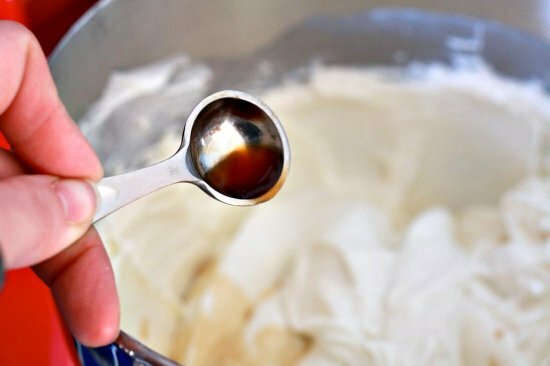 You cannot use whipping cream in it’s place. You could use sour cream. LOVE!!!!! Fell in love with you, your writing, AND your recipe!!!! Your so sweet! Thanks for visiting! Hi Meseidy, just bumped into your site looking for a guava swirl cheesecake. When I checked out your recipes I noticed your PR tradicional food recipe and could not believe my eyes. I am, as you say, dancing in my chair! From NY, parents from PR and Cuba. 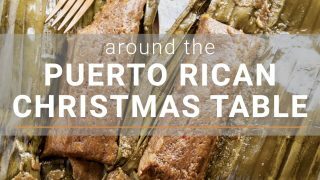 Lived in Guaynabo for 24 years, so PR food is my passion. Valdejuli is also my favorite cooking chef. Thank you for sharing and look forward to your blog. The woven glass/silicone molds worked; I did not use water or foil. It took nearly two hours to cook though, and the center was still quite jiggly; I was nervous to keep cooking it after that. My oven is a little weak; most things take longer than they should. I also substituted Maria crackers and butter for the crust; that worked great. 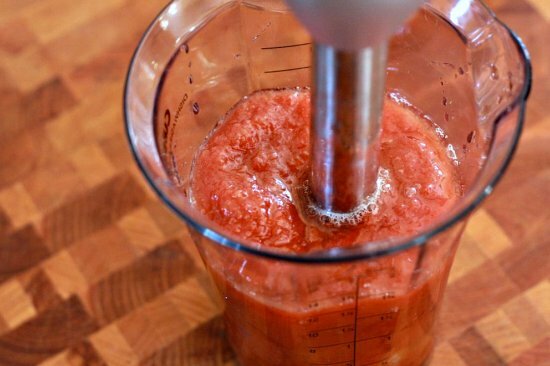 I believe guava paste can probably be substituted for the shell puree…my mother says to soften it in the microwave with some brandy or rum. I have yet to test that. And here I was wondering what to do with all those “casquitos” mami sent me, since I’m using the last of the paste on another cheesecake tonight. . . And here comes another Boricua (and another Rivera at that) to save me! It looks great. I use silicone/woven glass molds, so I’m wondering about the water bit….I’ll have to experiment. I’ll report back! I had several problems with this. Most notably, guava shells in heavy syrup is not found in North Carolina! After searching all over the Triangle, I had a friend bring me 2 cans from Florida. Secondly, my cake was so light and liquid-like, that the guava sank. I could not swirl it very well, it just sank right into the cake. So, I tried instead to just mix it in, so that it was incorporated into the cake itself. I hope it works out, as it’s in the oven now. I made this for my friends and they loved it!! Very good! and I love guava with cheese! thanks! i LOVE guavas and can’t wait to try this. It’s nice to see a lighter version of cheesecake. I love it, but always find it to be very heavy, especially when you just want to satisfy a sweet craving. This one seems perfect and won’t make me feel as guilty. Thanks for posting! I’m not one to eagerly pick the cheesecake item when eating out and I think I’ve only made one once. HOWEVER, this recipe has my palate screaming for this deliciousness! Pioneer Woman linked this recipe to her post today and I am so so so thankful. I think I’ve died and gone to heaven! A light cheesecake!! Miracles!! OmiGod this is cool and super delish! I am a total guava lover and make my own guava preserve coz my family lovesss it , and me too. We have it along with a jar of Nutella , both must have’s ,lol. And tell u what ,this is a Romeo and juliet cheese cake,u know why? So random, I just emailed the original Cranberry Cheesecake recipe to my sister this morning! My man and I LOVE guava, and we had a version of this cake when we were in Florida. We’ll be making this one immediately! Thanks for sharing ! Every time i hear Guava i think of Hawaii – they have guava drinks everywhere. Your cheesecake looks fabulous, fabulous!!!! Great idea to put guava in there, i bet the sweet and creamy is just awesome! Could you substitute Guava paste? I adore guava! Yes, Please! I’m making this for my next dinner party! I have been looking for this recipe all my life! Ok I’m exaggerating, but it’s one of the things I’ve been homesick for lately. Making it this week! THANK YOU!!!! oh goodness this looks amazing. Will certainly try this one. 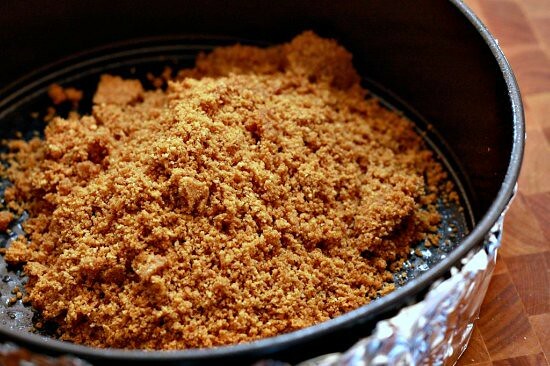 A question if I may, can graham cracker crumbs from the box be used? Awww, I washoping you would use guava paste! I am going to make this!! It looks so yummy!!! And the little story in the beginning …loved it. It reminds me of a story I once read in Puerto Rico. Is called “historia de arroz con habichuela”. If you haven’t read it before you can read it in this link.Is in spanish. This is a keeper. Can’t wait to try it. I am salivating at work. I too prefer light cheesecakes. This one looks absolutely delicious, and you make the preparation seem to easy! Perfect! That cheesecake is beautiful.